While driving around today I happened to be stopped at a light when I noticed this vehicle sitting next to me. I had to rush to get the camera out before the light changed. If you can’t read his side window, it says “Experimental Hybrid”. 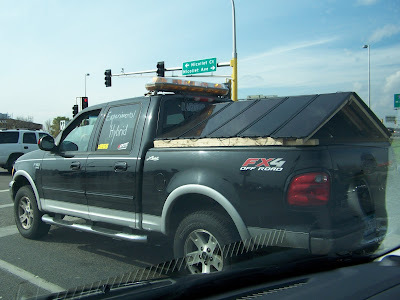 On the back of the truck are 10 solar panels, sitting in the bed. Now, I don’t know if this is a joke, or if somehow this really works. If anyone out there knows, please tell us!